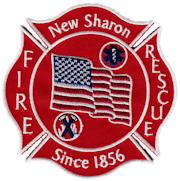 As Chief of the New Sharon Fire & Rescue Department I extend a warm welcome to you. Our main goal in the New Sharon area is to do what we can to assist you in preventing property damage & injury. We hope to heighten your awareness of safety measures that you can take in order to prevent suffering unnecessary losses. We also want you to know that we are a group of community volunteers that are well trained and prepared to assist you in the unfortunate event that you suffer a loss due to fire or succumb to a physical ailment that requires professional assistance. In addition to reading about our department, it’s history, equipment, & personnel, we have made available to you information that will assist you in making good choices with regard to maintaining a safe home environment. We will make available to you contact numbers that may possibly save you or a loved ones life. Numbers such as “Poison Control Center”, local hospitals, clinics, and HazMat. In a real-time emergency it is crucial that you are able to LOCATE & CALL the appropriate emergency services so that they can respond in a timely manner. TIME is critical in an emergency situation. We have posted EMERGENCY NUMBERS to the left of this greeting so that they are readily available for you to refer to in the untimely event that you need to locate the right number to call ‘FAST’.